Born in 1957 in Tashkent (Uzbekistan), Elena Kats-Chernin received training at the Gnessin Musical College before immigrating to Australia in 1975. She graduated from the New South Wales Conservatorium of Music in 1980 and was awarded a DAAD (German academic exchange) grant to study with Helmut Lachenmann in Hanover. She remained in Germany for 13 years, returning in 1994 to Australia where she now lives in Sydney. 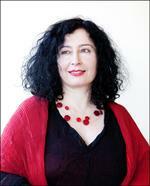 Elena Kats-Chernin has created works in nearly every genre. Among her many commissions are pieces for Ensemble Modern, Australian Chamber Orchestra, Australian World Orchestra, the Adelaide, Tasmanian, Melbourne and Sydney Symphony Orchestras, the Australian Brandenburg Orchestra, City of London Sinfonia, Swedish Chamber Orchestra and the North Carolina Symphony. Her colourful, energetic, and often propulsive music has been choreographed by dance-makers around the world. In 2000 she collaborated with leading Australian choreographer Meryl Tankard on Deep Sea Dreaming which was broadcast to an audience of millions worldwide as part of the opening ceremonies of the Sydney 2000 Olympic Games. Works from the following years include the concerto for basset clarinet and chamber orchestra Ornamental Air which has been toured internationally and also released on CD for Chandos by Michael Collins and Five Chapters, concerto for saxophone quartet and orchestra, composed for the Rascher Saxophone Quartet. For the Australian Brandenburg Orchestra and choir, she composed Prelude and Cube in 2015. Kats-Chernin's music continued to be heard on TV and at the cinema in the UK with the long-running Lloyds TSB advertising campaign 'For the journey…' employing Eliza Aria from her ballet music to Meryl Tankard's Wild Swans. Her piece Russian Rag became Max's theme in the claymation film Max & Mary by Adam Elliott. In 2011 Kats-Chernin was appointed composer in residence with the Queensland Symphony Orchestra. Her first symphony, Symphonia Eluvium for organ, choir and orchestra, commemorating the devastating Queensland floods of January 2011, was premiered that year by QSO conducted by Asher Fisch at the Brisbane Festival. In 2012, the work was voted by the readers of the Australian monthly arts magazine Limelight as the best composition of the year. Elena Kats-Chernin is one of the subjects of a Creative Minds 6-episode series of artist portraits. The documentary by Robin Hughes was made for Australian TV's STUDIO channel. A double CD of her complete music for string quartet, performed by Acacia, was released under the title Blue Silence by Vexations840 in 2012. One of Elena Kats-Chernin's most recent major premieres was her adaptation of Monteverdi's three operas (Orpheus, Odysseus, Poppea) at the Komische Oper Berlin, directed by Barrie Kosky, in September 2012 - a 12-hour marathon performance with live telecast on 3sat TV. In January 2014, her music for the drama Frankenstein at the Sydney Ensemble Theatre won jointly the Sydney Theatre Award 2013 for the Best Score. In March 2014 she was a joint winner of Sidney Myer Performing Arts Award. Her opera Schneewittchen und die 77 Zwerge opened at Komische Oper Berlin on the 1st November 2015. The dance piece Three Dancers, choreographed by Didy Veldman to Elena' Kats-Chernin's music, had been premiered at Sadler's Wells by Rambert Dance Theatre Company, London, on the 3 November 2015. Her TV opera in 4 episodes The Divorce was nominated for ACCTA (The Australian Academy of Cinema and Television Arts Awards) in the category Best Music for Television. It was produced by the Opera Australia, ABC TV and Princess Pictures and broadcast in December 2015 on ABC TV. The cast included Kate Miller-Heidke and Meow Meow. Among her most recent premieres was The Witching Hour, a highly acclaimed concerto for eight double basses for the Australian World Orchestra, performed at the Sydney Opera House in September and at the Esplanade Concert Hall in Singapore in October 2016. Her Singing Trees for the Australian Chamber Orchestra was premiered in December 2016 at the Melbourne Recital Centre. In 2016 Shobana Jeyasingh's dance work Material Men redux was premiered with Elena Kats-Chernin's score performed by Smith String Quartet. The original, shorter version of this piece, titled Material Men, was premiered a year earlier at the Southbank Centre in London. Kats-Chernin's CD Butterflying (piano works for 4 hands, with Tamara-Anna Cislowska, ABC Classics) was at the top of ARIA Classical Core Chart for 13 weeks, reaching number 1 in September 2016. Her most recent recording Unsent love letters-meditations on Erik Satie (Tamara-Anna Cislowska, piano solo, on ABC Classics) debuted at number 1 on the ARIA Classical Chart in March 2017. In April 2017 this album got released on the Deutsche Grammophon label. In 2017 she is a composer in residence with the Melbourne Symphony Orchestra, with five performances of her work, including two premieres (harpsichord concerto Ancient Letters and Big Rhap in May 2017). Beaver blaze : chamber ensemble Commissioned by Betty Beaver. Interludes and rags : chamber ensemble Commissioned by 2MBS-FM Radio (Sydney). Obsidian Light : full orchestra Commissioned by Tasmanian Symphony Orchestra. The food chain (vocal quintets) Commissioned by HUSH Music Foundation. Book: A study of bricolage in Elena Kats-Chernin's opera Iphis / Jane Stanley. - Article: Regaining lost composure. - Document: Profile -Rita Williams talks with composer Elena Kats-Chernin, equally at home writing for the concert hall and for the theatre. - Program note: Elena Kats-Chernin's "Clocks"